Restored self-esteem and renewed self-confidence. Our patients who now enjoy the benefits of their new implant supported replacement teeth talk openly about their restored self-esteem and self-confidence as a result of a younger appearance, ability to eat the foods they want, increased comfort, and improved overall health. Immediate results. With TeethToday®, failing teeth can be immediately replaced with new implants and restorations in one procedure, the same day. This streamlines treatment, saving time, money and anxiety while improving the quality of the final results. TeethToday® offers dramatic improvement in chewing ability, security and overall comfort. Improved appearance. Since implants preserve bone, preventing deterioration of the facial structures, appearance is improved. When all the natural teeth are severely compromised or missing, there is nothing left in the jawbone to stimulate bone growth, the body senses that the jawbone is no longer necessary and begins to dissolve it away. This results in facial collapse. After about ten years, it often becomes difficult to wear a denture because there is little bone left to support it. This results in the lips folding in, and the lower face shriveling up (witches chin) with wrinkles around the mouth (marionette lines) showing a much older looking person. With dental implants, the appearance of these wrinkles caused by posterior bite collapse, or complete facial structure collapse is virtually eliminated. Remove the embarrassment factor. Implant supported replacement teeth never have to come out, not for daily cleaning, not for home care hygiene maintenance (brushing and flossing), nor even during a hospital visit or other medical exam. They are permanent. Just like your new smile. The mouth is restored as closely as possible to its natural state. By replacing the entire tooth, including the root, it is possible to replicate the function of natural teeth, with a strong, stable foundation that allows comfortable biting and chewing. In addition, nothing in the mouth looks or feels artificial. Dental implants are the closest thing we have to our natural teeth. Healthy adjacent teeth are not destroyed to replace missing teeth. Tooth replacement with traditional tooth-supported bridges requires grinding down the teeth adjacent to the missing tooth/teeth, so that the bridge can be cemented onto them and into place. This tooth structure can never be replaced and the long-term health of these â€œpreparedâ€ teeth is compromised. Partial dentures have clasps that hook onto adjacent teeth, putting pressure on the adjacent teeth as the partial rocks back and forth. Eventually these teeth can loosen and fail as a result of this unnatural pressure. Replacing missing teeth with implant supported crowns/bridges does not involve the adjacent natural teeth, so they are not compromised, damaged or destroyed. If removable dentures and partials are replaced with implant supported fixed bridges, the overall enhancement in quality of life is even more significant. Unsightly destructive metal clasps common with partial dentures, which tend to damage adjacent teeth and gums are now non-existent. Failing teeth can cause other health issues. It is well documented that periodontal disease is a bacterially induced chronic infection and inflammatory disease that does not resolve by itself. Unchecked, inflammation and infection contributes to heart attacks, strokes, Alzheimerâ€™s disease, diabetes and other chronic diseases. Dentists and cardiologists have long known that neglecting your teeth can lead to more than just a toothache. Scientific studies indicate there is a link between periodontal disease and cardiovascular disease. It has been shown that improving poor oral health can actually improve your overall health. Meet our patients. 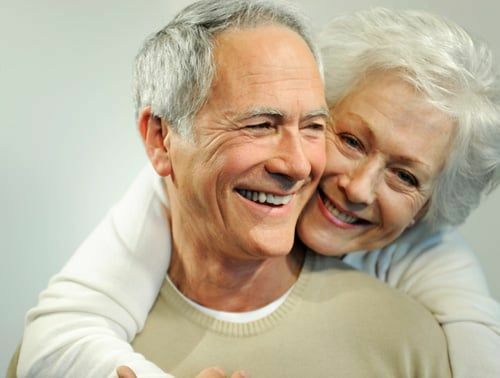 Be one of the many who now enjoy the benefits of implant supported replacement teeth. As a result of improved appearance, comfort and health, our patientsâ€™ stories tell of how their lives have changed and their quality of life simply made better. See for yourself. Click on this Smile Gallery link.